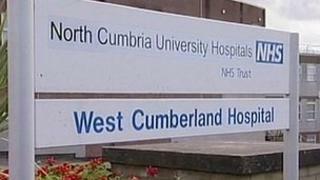 A cash crisis could be putting patient welfare at two hospitals in Cumbria at risk, according to some of the staff. They say there is a shortage of beds and low morale at Carlisle's Cumberland Infirmary and the West Cumberland Hospital in Whitehaven. A number of incidents have been reported to BBC's Inside Out programme. North Cumbria University Hospitals Trust said it would investigate the claims, and insisted patient care was not suffering. The trust needs to make savings of £15m and in a recently leaked email its Chief Executive, Neil Goodwin, described the situation as worsening, with urgent action needed. This included closing wards, stopping hiring temporary consultants, and ending short term contracts. Speaking to Inside Out anonymously, a nurse from an outpatient's department said: "The demands on the service are too great for the people... that we've got. "If somebody needs their pain sorting out it will wait until they're seen on the ward." An A&E staff member, who also did not want to be named, said financial pressures meant they were hesitant about opening beds for patients waiting in cubicles. It was described as a "blame game". "If the duty matron opens beds, especially over the weekend, they're hauled over the coals by business managers on Monday morning." However, Neil Goodwin said: "We do open and close beds as demand requires it. "I would be disappointed if staff were told off for opening beds. It's about proper use of resources to meet demands in patient care." Low morale among staff was also highlighted. Another nurse said: "Staff are on anti-depressants because they are cracking up." A staff member who was willing to be identified, consultant orthopaedic surgeon, Guy Broome, added: "If things really can't be resolved... I will leave, to a post where I can work more effectively." Neil Goodwin said: "We are concerned with bottom line performance, and that's why we are concerned about improving financial management. "There's no evidence to say we have safety and quality concerns. "We're a high performing hospital in those areas, and there's a good relationship between the trust board and the consultant staff at the hospital." Inside Out can be seen on BBC1 in the North East and Cumbria on Monday 28 November at 19:30 and on Sky 975.